Mumbai, Feb 7 (IANS) Actor Mohit Raina has been roped in to play the role of a police officer in the upcoming police drama "Bhaukaal". The series is inspired by the real-life achievements of Navniet Sekera, an IPS officer who brought down an organised crime syndicates in Uttar Pradesh in the early 2000s. Actor and producer Harman Baweja is the creator and showrunner. 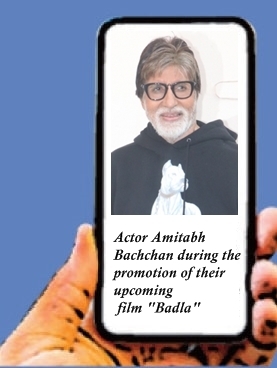 He has teamed up with director Jatin Wagle for the series. The series will adapt real life stories based on the criminal gangs and their turf wars. It will also highlights the nexus of criminals, local persons of influence and authority and their impact on people and local culture. "'Bhaukaal' brings me a chance to play a brave police officer, one who brought change and broke through the age old criminal and local political nexus. I am happy and excited to play this character," Mohit said in a statement. The series is being made by Applause Entertainment, the content studio from the Aditya Birla Group, along with Baweja Movies.It also features Abhimanyu Singh, Siddhanth Kapoor, Bidita Bag, Sunny Hinduja, Rashmi Rajput, Pradeep Nagar and Gulki Joshi. It is written by Akash Mohimen, Jay Bansal and Rohit Chauhan. Baweja said: "I've always wanted to create a show that flips how we perceive the real world and Navniet Sekera's story is just that, unapologetic, compelling and inspiring. The riveting story showcases the challenges faced and heart with which the police force fights crime." To this director, Wagle added: "What drew me to the story is the length a person can go for what is right; risking his own existence is the essence of the story. The risks Navniet Sekera took to try and better a faulty society is just outstanding. A son, a husband, a father and above all this a true Indian and a true human being, this is a story that needs to be told." Sameer Nair, CEO Applause Entertainment, also added: "'Bhaukaal' captures the thrill and drama of law and order tackling crime in a localised Indian context."